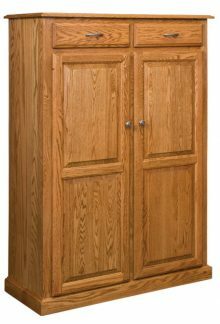 Instantly add additional storage space to your kitchen with an Amish Pie Safe or Jelly Cupboards. We have a big range of 63 kinds of pie safe cabinets and jelly cupboards in this section such as McCoy Pie Safe, West Lake Pie Safe, Tall Shaker Jelly Cupboard, Harvest Pie Safe, Fresno Jelly Cupboard, and many more quality products. No matter how much storage or space your kitchen already has, there’s no doubt that it could always use more! As the one room in the house where people always seem to gather, the décor and organization of your kitchen is key. Not only do you want everything to look as beautiful as possible, but you also want your décor to be functional, as this is also one of the most-used rooms in most homes. 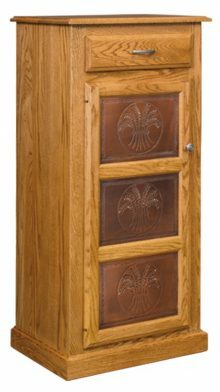 The Amish oak pie safe offers the convenience of additional storage while providing the elegance of a statement piece. But just because it’s called a pie safe or a jelly cabinet doesn’t mean that these are the only two uses for this multipurpose piece of furniture. In fact, you can store anything from plates and glasses to pots and pans within the doors of your Amish jelly cupboard. The best part is that no matter what you’re storing inside this solid wood pie safe, the cabinetry design can work in any kitchen so long as it has just a hint of wooden accent or trim. 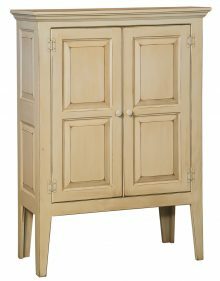 And if your kitchen just happens to be decked out in chrome appliances and stainless steel cabinetry, you can still find a place for this Amish jelly cabinet in your traditionally decorated dining room, sitting room, bathroom or even your entryway. The possibilities are truly endless! 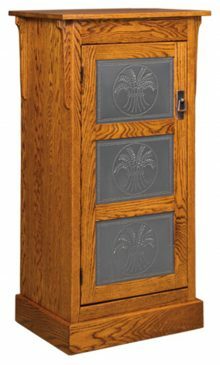 Your children will want to take many of your belongings when they venture off on their own and begin to build their own lives in their own homes, and while many of the things that you give them will be replaced over the years, these Amish pie safes have the capability of going the distance and becoming an heirloom that’s passed on from generation to generation. That’s exactly why you must take care to maintain it. To keep your Amish jelly cupboard looking as beautiful years from now as the day you bought it, all you have to do is clean and dust it on a regular basis and make sure that it’s protected from the elements. Humidity, extreme heat and direct sunlight can all effect the beauty and integrity of natural hardwoods, so be sure to keep your solid wood pie safe clear of these dangers. 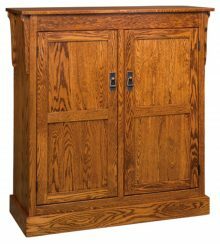 These Amish pie safes are made using kiln-dried hardwoods such as Hickory, Oak, Maple and Cherry, which give them a durable advantage, as these hardwoods are known to be resilient and sturdy. 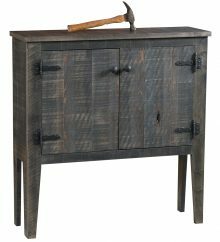 In addition to the strength and reliability of the building materials used, Amish artisans also construct them with the utmost care and craftsmanship. 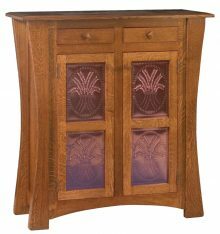 Unlike factory-produced furniture, these cabinets are made to stand up against the test of time so that future generations may also use and enjoy them. We’re located right in the heart of Amish country, in the picturesque village of Smithsville, OH. We are a family-owned and operated business dedicated to providing the highest level of service from the time you order to long after we deliver your products. We believe in the traditional American values of honesty, fairness and hard work. The minute you order your first piece of furniture from us, you become an extension of our family and will continuously be treated as such. Purchase any of our handcrafted pie safes today and get up to 33% off of the retail price of your entire order. If you purchase large or bulk orders, you can receive up to an additional 13% off, and if you pay with a check, you get an additional 3% off on top of that. We work hard to ensure that you’re able to purchase the highest-quality products from our stores without having to deal with high prices. Browse our collection of jelly cupboards to find the right fit for you and your home! Use our online ordering tool to customize your order to include the wood type of your choice, as well as the stain finish. Then sit back and wait while we get to work building you your one-of-a-kind jelly cupboard. Upon completion, we’ll even ship it directly to your door so that, once you hit the order button, you don’t have to worry about a thing.